Once upon a time - ten years ago today, as of this writing - a game called Heavenly Sword made its debut on the PlayStation 3. It might've seemed like just another triple-A effort back in 2007, but like so many enduring legends, Heavenly Sword represents something much greater. Many stories can be told about this game, such as the involvement of actor Andy Serkis, the creation of a related movie, and the perennial clamoring for a sequel. But looking back, the most striking thing about Heavenly Sword is that it marks the beginning of journey entirely apart from Nariko's. Rather than a red-headed, sword-wielding warrior, the protagonist in this particular story is the team that created her. 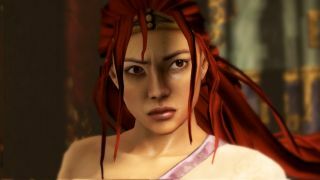 A decade later, Heavenly Sword remains the first glimpse of what Ninja Theory had the potential to become, and what it has grown to be: a studio crafting unique, genuine, and totally original experiences that redefine what games can accomplish as an artistic medium. "I saw the writing on the wall that publishers weren't picking up smaller games, and if we didn't go for something big, we would likely not survive," Antoniades says. But he was driven by more than just market demand: "I wanted to make something big and ambitious. I wanted us to be a top studio in the world." Big and ambitious are fitting words for Heavenly Sword. Antoniades drew on his interest in kung-fu movies to help craft the basic concept of the story. At that stage in his career, he said he was already talking about the potential to make a game that did more than present interesting mechanics and systems. Completing the project took gruelling hours as the team worked together to develop the idea for a Wuxia-inspired game into a fully realized story with its own characters and world. Antoniades recalls works days that lasted from 6am to 10pm while the whole team was sequestered away in New Zealand. It was a massive undertaking built on technologies that were then new to the games world, from behind-the-scenes work with motion capture and HDR lighting to the very console the game was made for. As a PlayStation 3 exclusive, Heavenly Sword was designed to show off what the console was capable of, and that meant added involvement (and pressure) from Sony. The game took four-and-a-half years to make, with a team of more than 100. As the workload ballooned, so too did the restrictions around Ninja Theory's ability to make the game they wanted. "I think Heavenly Sword was hampered by its production in the sense that it was a triple-A, mass-market game with a lot of people on it, under a lot of pressure, and it had to fit in more with what a standard action-adventure video game should be," Antoniades says. "It either took guts or stupidity." The final product does show the difficulties of reconciling commercial demands with artistic concepts. Heavenly Sword's reviews were mixed. While the acting and technical accomplishments received praise, many criticized the short runtime and uneven pacing. The combat style, borrowed from the recent God of War, invited direct comparisons that usually weren’t in Heavenly Sword’s favor. Sales were underwhelming. Antoniades acknowledges that the game had shortcomings. "We cut quite a lot out of that game just to get it out, and I think a lot of it felt unfinished, or imprecise, or just a little bit jagged around the edges," he says. "When it came out, I didn't feel happy and content." But even with those issues and some unrealized aspirations, Heavenly Sword still has its dedicated fans, and proved invaluable to the team that made it. "It's a flawed game but a very beautiful game,” Antoniades reflects. "There were just so many things we did in that game that were really pushing the envelope that it's quite remarkable. It either took guts or stupidity." For so many artists, that line between guts and stupidity turns out to be a pivotal moment. Ira Glass of NPR fame has a now-famous quote about what he called the gap - the time when a creative person has grand ideas for what they can make, but doesn't quite have the skills to realize them. "It's really not that great. It's trying to be good, it has ambition to be good, but it's not quite that good", Glass said of that artistic phase. Looking back, Heavenly Sword was Ninja Theory's gap game. The challenges of both technology and industry made it impossible to fully realize the complete, grand vision. But a spark of something special is clearly present in Heavenly Sword. Over time, Ninja Theory has managed to finesse the raw potential that continues to make Nariko’s adventure a cult classic. The company has refined its approach and its ideas until, just a month shy of Heavenly Sword's 10-year anniversary, it released Hellblade: Senua's Sacrifice. Having some history with Heavenly Sword makes the experience of Hellblade all the more riveting. The two games are clearly the work of the same creative process; just as some writers will always pen allegories and some painters only find their voice in watercolor, Ninja Theory games tell their stories with a familiar set of tools. A heroic journey, driven by a power that the hero doesn't completely control. Desperate fights for survival. Sweeping narration and monologues to the camera. Evocative, cinematic artwork. But beyond those parallels in the technical choices, Hellblade reveals a new degree of sophistication that Heavenly Sword was unable to reach. Its depiction of psychosis is a complex and intense subject for a game to tackle. The studio did its due diligence, collaborating with psychologists and historians. But perhaps most importantly, Ninja Theory was able to pursue the project independently. The impact of total creative control can be seen in how efficiently and effectively the studio’s efforts took shape. Even though a mere twenty-some people worked on Hellblade, it took less time to complete than Heavenly Sword and yielded an even longer final product. And if you ask Antoniades, the end result has brought satisfaction at last. "Hellblade is almost like a cathartic 'this is what we really wanted to do'," he says in contrasting the two works. "I think it's the first game I've finished where I feel like the actual ambition behind it and the execution of it was allowed to develop. And as a result, it's worked in a way that I didn't imagine it would. I felt content that we had achieved what we set out to do on Hellblade." If Heavenly Sword was the beginning of Ninja Theory's story, then Hellblade marks not a final destination, but a major milestone. Antoniades, at least, has no plans to stop walking this creative path. "I believe in this medium," he says. "And this medium hasn't really got going in a way, games haven't been fully explored. I'm encouraged by Hellblade. I just think that there's so much more potential in games to do really amazing things, it's keeping me in." And so the hero journeys on.